Day 42: Multi-tasking is (only some of) Us! Despite the popular idea that all women are good at it, I can’t do multi-tasking, and am full of admiration for those who can. Foremen have to do it. Although, as Graham points out, working foremen, like himself and Gordon, often don’t get the chance to do the work bit, because one is so busy thinking ahead and answering questions from all the different trades on site that most of the time is spent referring to drawings, making calculations and answering questions. Well, I’d call that work, but he reckons it doesn’t really count. So I’m glad that before we reach this stage of managing all the trades, he has had time to give proper care and attention to the drainage, and I should have pointed out yesterday that Graham is a bit of an artist when it comes to concrete. You’ll never see this bit once the floor is down, but Graham points out that it’s basic common sense to take care over each stage, because the better you make that, the easier it will be for the next bloke who comes in, and the smoother the whole job will flow. 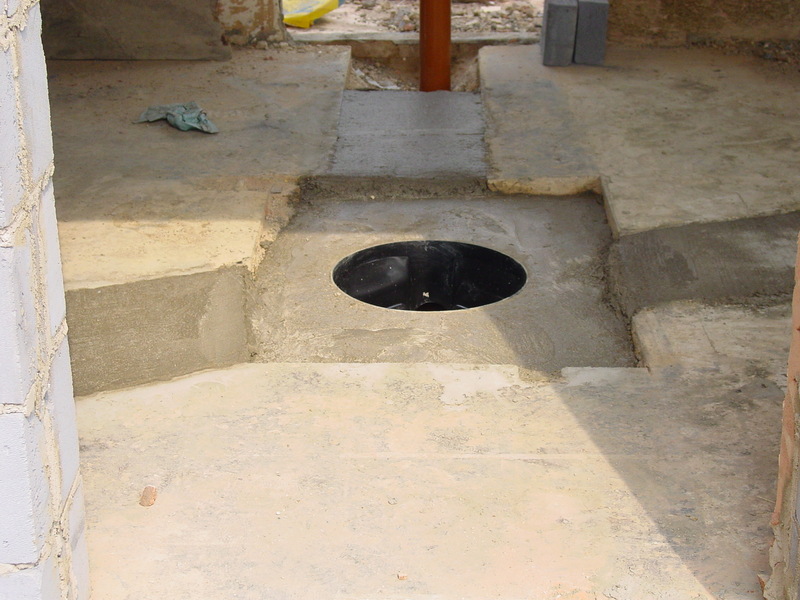 And the reason the level of the top of the manhole is lower than the surrounding area is to do with what will happen when the floor is laid. This will be adjusted with bricks and mortar once the overall level is known. A decent surface will make it quicker and easier for the brickie. There could be quite a sizable discrepancy between one part of the floor in a building and another, so you have to take your measurements from the highest point, that being the point from which you measure for door lintels (see what I mean about multi-tasking?) and that will be your overall level. The cover of this manhole will have to await the final measurement and then you’ll never see it again. So I thought I’d show it to you now.